This Leisure battery product is very good and performs exactly to specification. Seems to be well made and the terminals are of good size and sturdy. Would definitely recommend this "Banner" battery and would purchase again. Very soon I will be buying another battery, for my car, and using M/sTayna again, due to their excellent service, product choice and delivery options. 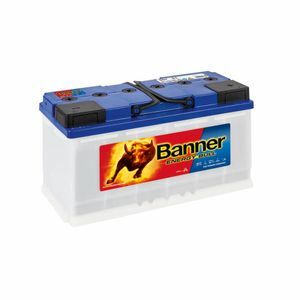 This "Banner" battery is recommended for my motor home, and not many alternatives are available due to the size of the battery box and motor home warranty restrictions. All this said it has proved an excellent battery giving 3 years excellent service. I could have had more life if I had purchased the battery tool earlier and been able to top up the electrolyte, (my problem not "Banners"). Very impressed with the product. I have now purchased a second battery to beef up the battery pack. I Would certainly recommend and buy this product again. Early days, we have not used the batteries wild camping yet. They are charged and waiting to go. If they do what Banner say they will do they will be good value. Excellent service as we live in Piortugal we weren’t sure how quickly the product would arrive. In fact the delivery was speedy and the ability to track it on route was brilliant. At this time can only comment on the delivery which was surprisingly quick .. within 18 hours of order. The battery was well packaged. No complaints whatsoever..
Used these batteries last week and really happy with them. Do exactly what it says on the tin. Service and delivery from Tanya was above and beyond. Highly recommended. Hi Have not used it yet , hopefully it will be ok for my motor mover , will be using it for the first time in 2 weeks . Brilliant service from Tayna (I was let down by another supplier! ), they shipped very quickly and it was here next day. The Banner battery is excellent quality and seems to last a long time in my camper, much better than the old one anyway. It was worth getting a good quality brand such as Banner as it'll take the abuse of everyday use. Ordering straight forward and delivered on time. Clear instructions for fitting and use. Very good staff and service was 2nd to none even down to delivery time, well done.